The invention of portable workbench proved to be quite helpful for craftsmen, artisans, students and other professionals related to diverse work fields. If you are on this page, you are searching for the best workbench but are confused to select the best. In the marketplace, you certainly would find a variety of workbenches from different manufacturers with different designs and qualities. The popularity of workbenches spread wide because of its features! It is portable and versatile. With secure storage feature and space-saving nature, people across the world admire it. It is difficult to purchase the workbench that would perfectly suit your needs. A stylish folding portable workbench may not guarantee on its durability. On the other hand, a durable workbench may not look impressive. You need to learn about different types of workbenches before purchasing one. You need to consider several factors before buying the workbench. 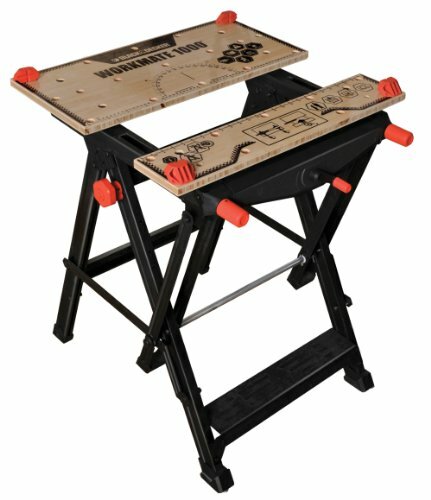 On this page, you will get the list of top 10 folding workbenches. After going through this content, you will be able to judge and select the best portable folding workbench. The workbench you choose must suit your needs. Let’s begin the journey of selecting the best suitable workbench. 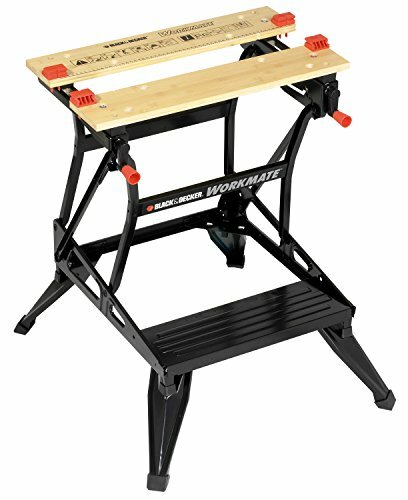 Black Decker Workmate WM825 is a folding workbench with excellent design. It features dual working heights. You can use it as a workbench or bench tool stand. The heavy-weight steel construction of the workbench makes it highly durable and sturdy supporting up to 250 Kg weight. The jaw retention grooves and swivel pegs provide versatile and reliable clamping feature. The user can easily adjust the clamps for the single-handed clamp system. The front jaw swings up offering vertical clamping. With increased flexibility, it is easy to clamp the odd-shaped objects. It weighs around 15 Kg and measures around 20X74.2X74 cm. Set up Bosch Work Bench PWB 600 within few minutes! The manufacturer engineered this folding workbench with the best designs to hold several workpieces perfectly. It is water resistant and highly durable with an excellent surface finish. The surface of the workbench is of bamboo while the aluminum frame of the product is highly durable and robust. You can work safely with this workbench. The smart clamping system of the product fixes the workpieces firmly. When the bench gets folded, it measures only 9 cm that makes it compatible to carry and easy to store. It weighs around 11.6 Kg for which you need not get stressed to carry it to different places. It is the best portable workbench available in the marketplace. This workbench can hold materials of about 200Kg. Follow the instruction manual to set up the product and use it as per your needs! Purchasing this product is worth the investment. Folding design to save storage space. Keter 17182239 Master Pro is a portable workbench. The workbench folding feature makes it easy to carry and easy to store. The manufacturer designed the workbench with quick-opening system ensuring easy transportation. The package consists of 12-inch clamps that allow easy set up either horizontally or vertically. You can set up the product and make it suitable for different jobs. With this product, you get a large work surface, and its strong feature turns it stronger to hold the weight of around 453 Kg. Use your DIY skills and set up the product for works like sawing, brushing, nailing, and many more. You need spare few minutes to set up the product and use it for the fulfillment of your purpose. It is very lightweight that makes it portable. You can carry the product without any hassles or stress. At the same time, the product is heavy duty. The product weighs around 12.3 Kg and measures 85X55X75.5 cm. The manufacturers smartly engineered Black Decker WM536 with dual working heights. You can use the product as a workbench, bench tool stand or vice as well as a sawhorse. Its durable steel construction/frame guarantees long lasting feature. The anti-slip rubber feet prevent the workbench from slipping while working. This folding portable workbench will easily collapse into a compact size, and you can carry it anywhere easily. You also can store the product without any special requirement of storage space. The dual clamping cranks increase the clamping force as well as the versatility of the product. It has adjustable swivel pegs as well as jaw retention grooves that provide clamping versatility and strong material hold. The workbench is easy to setup and doesn’t require extensive effort for cleaning. The adjustable pegs allow holding objects with an irregular shape. The product will sustain the load of 160 Kg. It weighs 10.8 Kg and measures 62X16.6X71.4 cm. WORX- WX051- Pegasus is a multifunction work table. You can convert the portable folding workbench into a sawhorse within few seconds. The product has inbuilt storage shelf, and you don’t assemble the product. The workbench is compact, lightweight and foldable. You can carry it anywhere and store it easily. When the workbench gets folded, the thickness measures 5 inch which ensures easy storage. When the product is in worktable mode, it can support weight up to 300 lbs, and when the product is set up in sawhorse mode, it can bear up to 1000 lbs. It features locking legs that won’t create any trouble while working. You can work confidently with two quick clamps and four clamp pegs. The table top measures 31X25 inches and the workbench measures 32 inches in height. The product weighs around 30 lbs. If you have DIY skills and love to spend your time by deploying your skills, WORX- WX051- Pegasus could be the best companion for you. Wolfcraft 6177000 Master 200 gets mentioned in the list of best portable workbench UK! The universal clamping and working table is perfect for workshop or household. It integrates tool rack that offers additional safe storage for different equipments. This workbench is highly cost effective. The aluminum frame makes the workbench lightweight and durable. It takes few seconds to unpack the product and with few assembles; it gets ready for working purposes. It can support a load of 180 Kg. The bench top measures 645 X 300 mm. With easy clamping system, you can make spindle adjustment. To learn more about making the workbench suitable for different go through the instruction manual provided by the manufacturer. This robust and universally useful clamping workbench weighs 11.3 Kg and measures 36.5X80X64.5 cm. The product is lightweight and portable. You can carry the useful workbench easily to different places without any stress or effort. You can also safely store the product without any hassles. Stanley FatMax Folding Workbench Express is the best folding workbench for professional workers requiring robust and portable working surface. The perfectly engineered workbench offers a spacious working platform and substantial material capacity. The work surface of the workbench is suitable for pro applications like electric and manual sawing, screw driving, drilling, woodworking, gluing, part cleaning and several other jobs. The package includes an extensive range of vertical and horizontal clamps. You can easily set the workbench within few seconds and start working on it. The product features X-Shaped grooves, and dog-bench holes that allow easy clamping of wood, plastic and wood items. The highly durable metal legs make the product stable and versatile. The workbench can bear the material weight of around 455 Kg. The compact unit is foldable and you can carry it to any place without any special effort. Two sturdy handles on each side of the frame makes it easier to carry from one place to another. The product weighs around 10.4 Kg and measures 61X85X11 cm. A workbench portable and lightweight would be the best for DIY enthusiasts as well as professionals. 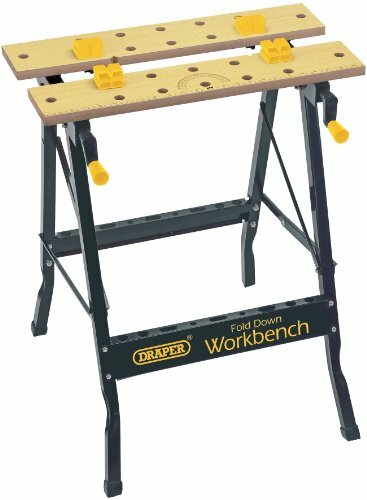 Draper DIY Series 09788 is portable workbench integrating dual clamping action. It features 12 holes for work clamping dogs. It is easily foldable which ensures easy storage and easy to carry. The manufacturer designed the workbench with sturdy legs from strong-box section steel. It is highly durable and strong. The manufacturer strictly follows the quality standards and produces the best workbenches. It weighs around 5.4 Kg and measures 88.6X13.2X13.2 cm. Follow the instruction manual to setup the product and turn it useful for different purposes. Are you looking for the best folding workbench UK? Wolf Craftman’s Workmate could be a suitable product with strong features. The Workbench is made from a strong steel frame with aluminum work top. It is sturdy and highly durable. It has excellent vice clamping function. You can adjust the workbench into 3 positions and use it for cutting or other works in different angles as would suit the job. You can easily adjust the height of the product in 6 setting points. The package includes 8 clamping blocks. You can slide the clamps and adjust the worktop into the desired position. It is foldable and you can fold it easily that makes it easy to carry from one place to another. It is also convenient to store requiring minimal storage space. Adjust the foot with the locking lever to prevent hassles while working. The maximum load capacity of the product is 100 Kg. The product weighs 12.5 Kg. It is supportive to scale up your DIY skills! Black-Decker Workmate 1000 WM 1000-XJ is the best portable workbench UK. It is a free-standing workbench engineered with the best metrics and standards. You can operate this product single-handed. It is foldable and lightweight that makes it easy to carry to different places. It has an ergonomic footrest. The clamping depth of the product is 46mm, and the working height is up to 165 mm. The package includes four clamping pieces of high-quality plastic. The worktop is of solid bamboo and the space measures 670X 460 mm. It can bear a maximum load of 250 Kg. The product is highly durable and will last for longer time. The product weighs around 15 Kg. Make sure to go through the instructions in the manual for perfect setup. After going through the portable workbench reviews, you must have got an idea to select the best workbench depending on your needs. It will be easier to purchase the right product once you understand the features and flexibilities you get with different types of workbenches. Select the workbench depending on the work nature. The leading manufacturers design their products with unique and stable features. The manufacturers aim to scale up your productivity and creativity while deploying your DIY skills. The workbenches listed in the best portable workbench reviews are suitable for different works. You can use those at your workshop, garage, home or even at construction sites. Find the workbench that suits your needs and places the order today!